A 501(c)3 not for profit organization supporting the Fossil Ridge High School Sabercat football team. 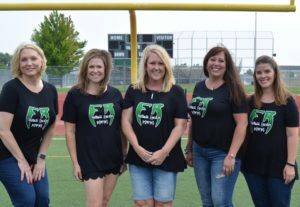 The purpose of the Fossil Ridge Football Booster club is to support the Fossil Ridge Football team through fundraising, sponsorships, and volunteer service to ensure access to quality athletic resources for safety and the ability to compete at the highest level. Fundraising events held throughout the year, such as Casino Night and Fight Night, provide funds used for equipment, team meals for home and away games, athletic nutrition, uniforms and workout clothing, scholarships, video equipment, as well as many other items needed to run a successful program. The Booster Club meets every last Tuesday of the month for meetings. The meetings are held at 7 p.m., please see the “Team Calendar” for the current venue. We look forward to seeing you there. If you have missed a meeting, all minutes are posted at the link below. 2019 Committee/Chair Volunteer Sign Up–Coming Soon! This is a fun way to meet other parents, support the Sabercats, and get to know the Sabercat fans and families while supporting our student athletes. Volunteers are needed for chain & scoreboard duties, spirit wear sales, homecoming, and various other activities. Please contact a board member for further details. We are always looking for sponsors for our football program and offer a variety of options to promote your business and support the Sabercats. Please contact any board member to determine the best option for your business. Sabercat spirit wear is available for purchase at home games. The Booster Club will also have online spirit wear orders available from other vendors. King Soopers Cards–UPDATED PROGRAM INFORMATION! Parents, friends and family can use their King Soopers loyalty card to donate to the Fossil Ridge football program. Simply link your card by logging into your King Soopers account, going to Community Rewards and selecting “Fossil Ridge High School Football Boosters” as your program of choice. Please note a 2019 program change in that funds from your King Soopers card are now donated toward the program as a whole, and not tracked by individual family to offset fees.